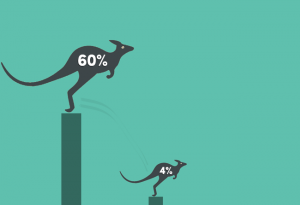 Home / Bounce Rate: How To Reduce It From 60% to 4%! Let me to start by saying that this article might not be what you’re expecting to. I mean, I will definitely tell you how you can reduce your bounce rate from 60% to 4%… but due to a MISTAKE often overlooked. Google Analytics designates bounce rate as the percentage of single-page visits. Furthermore, Google takes this into account when it comes to the ranking of your website. Thus, despite not being the most important metric of all, you better pay some attention to it. Basically, to calculate this number, Google divides the number of visits per one page only, for the number of total entries to a page. You can smoothly find your bounce rate on your Google Analytics account. On the left menu, select ‘Audience’, then ‘Overview’ from the drop-down. This will provide you with the overall bounce rate for your website during that period. To view the bounce rate for specific pages, select ‘Behaviour’, ‘Site Content’, and ‘All Pages’. A BAD PRACTICE that scales down your bounce rate massively! Sometimes to trim costs, instead of requesting a digital marketing agency to take care of your analytics, you attempt to do it yourself. This is perfectly normal! But if you’re too busy taking care of the whole business, these small lapses might happen. In the era of tracking, every marketer is seeking to understand his customer’s journey and, at the same time, forecasting their next moves. In parallel, Remarketing is extremely important to improve your conversion rate, because you’ll present your Brand to people that already expressed some interest in it. A client of ours had already installed Google Analytics and decided that it was time to track his website with Google Tag Manager. Nothing wrong until here. Unfortunately, amongst all the tags, he also created a tag for Google Analytics (forgetting that this platform was already tracking the website). The result? His bounce rate reduced from 60% to 4%, within two weeks! Some might say this is amazing. But as every digital marketer knows, this does not sound normal, as it usually take some time and efforts to get significative results. This result is simply… wrong data delivered by Google, due to double-tracking. This mistake is more common than you might think, and can “blind” you regarding the real bounce rate. Google is a bit mysterious about the way it ranks websites. But one thing is certain, a high bounce rate is generally equivalent to a bad user experience. Google’s mission is to provide the best results possible to each user, this can be seen as a red flag on your website. With that said, which factors may influence your Bounce Rate? Which ones can you improve quickly? Just by applying some of these steps, you’ll be able to reduce the “jumps” from page to page. Don’t forget that Google Analytics, doesn’t track scrolling (that’s why we don’t like this metric in particular). Someone might have read your article entirely, scrolled down, spent 5 minutes in total but not viewed another page… But unfortunately Google will only count one page session and this won’t be good for your bounce rate KPI. Which is not that fair. I hope this article helped you in some way, especially by avoiding this double-tracking mistake.